I've been doing lots of scrapbooking lately, which is making me very happy! I started scrapbooking over 8 years ago now and have a pretty big collection of layouts. It's been lovely to get back to scrapbooking and to be cropping with some of my old friends again. Here's a layout I have done with some photos of the great holiday I had with my sister and niece in the July school holidays. It was so nice to see them. I have a very close family and it's always nice to spend time together. The boys are growing up to know their Perth family so well, even though we live on the other side of the country. I like that they are growing up with the same values. A sense of family is so important isn't it? Antique Brads, Early Espresso striped grosgrain ribbon. Hope you like this layout. I'm definitely in the mood for some more scrapbooking so I hope to have another Stampin' Up!layout for you real soon. Been having lots more adventures with the boys this week as well. We had a great day at the show together on Thursday and then a day at the pool (yes heated!) on Friday. Today it's been glued to the telly riding out that agonising AFL draw. So it's Go Pies again for next week too now! Looking forward to another week of school holidays, then only 10 days after that I'll be off to Hamilton Island with the girls for an action packed Incentive Trip for Stampin' Up! with my lovely downlines Sue and Miriam - woohoo! Hello my lovely blog readers. Hope this finds you well and happy. It's school holidays here in Melbourne, so I am getting some hanging out time with my boys without the normal school routine. It's only early days so I am still loving it! I had a play with Stampin' Up! Printed Petals last night. This is one of the three free sets we got at Convention (yes - three! Stampin' Up! are a very generous company!). I needed a birthday card for the weekend for my 15 year old niece. I wanted it to be bright and happy, so I chose Daffodil Delight (LOVE this new yellow - it's a perfect shade! ), Regal Rose and early Espresso. It's a bit hard to tell, but some of the flowers are popped up on Dimensionals. This is a really sweet set and I know I will be using it again and again! I especially love the large flower with the floral pattern. 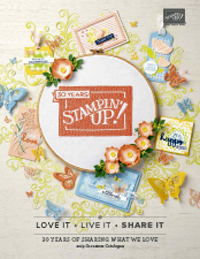 The other set I have used here is Stampin' Up! Perfect Punches. This set is GREAT to purchase if you have lots of our punches, because it's designed to perfectly coordinate with them (one of the things I love about Stampin' Up! stamps). You would be able to create so many great designs and cards using these two sets. I have quite a few more birthdays coming up this month, so hope to get some more cards made this week. I'm enjoying stamping at night once the boys are in bed because I know I can sleep in on school holidays! Crafting late at night makes me happy! This also makes me happy, my pot of Tulips and Pansies in full bloom. I have moved it in view of my craft room window and it makes me smile everytime I see it. The other thing that made me smile lots today was a little stamping party we had for Josh and some of his friends. Josh chose the stamp sets (Make a Monster was first on the table!) and helped me set everything up (including the snacks of course). Then I just let them loose with some retired ink pads, blank cards and punches with a few jewells for the girls (no glitter- I learnt that lesson, lol). They were so creative, it was amazing! They even decorated brown paper lunch bags and the white cardboard mat I had put down for a placemat. They were calling themselves artists, it was so cute! The Mums and I had coffee and chatted while they were being little artists. Where would we be without our school Mum friends! They are a lovely group of girls and I enjoy our holiday catch ups. Here's Josh all ready for his party (as I didn't want to post pics of the other kids on my blog). I guess you all know who we will be barracking for in Saturday's AFL Grandfinal! 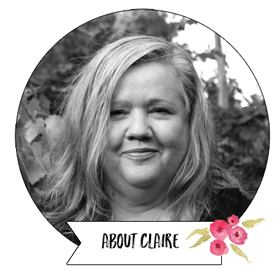 Today I have a very simple card for you using Stampin' Up! Elements of Style. Isn't this set just gorgeous? I haven't had a chance to order it myself yet, but my lovely downline Rach was heading off on a holiday with her family for 2 weeks and asked me if I would like to babysit her new stamps. Took me a few milliseconds to reply - YES PLEASE! I especially like this image watercoloured. I had my first play with one of the new Stampin' Up! InColours Blushing Bride in this card as well, and I love it every bit as much as I thought it would. It's a little bit more of a dusty pink than Pretty in Pink, and I can see I will be using it LOTS! So for this card I have watercoloured using my ink pads and the colours Always Artichoke, Blushing Bride, Regal Rose and Bravo Burgundy. I also used a bit of Sahara Sand around the edges (I think I might have got a bit heavy handed down the bottom - woops :) ). I also used the Sahara Sand Stampin' Write Marker in the Colour Spritzer to add a bit of a speckled effect around the edges. The Scallop Trim punch has been used on the edge and I placed a strip of Blushing Bride DSP (from the paper stacks - these are awesome!) underneath to highlight the edge. There's also a bit of this same paper under the greeting. I really liked how this card turned out, so I made two more using watercoloured images in different ways which I loved as well. These ones went out yesterday to my newsletter subscribers. Just sign up and then send me a quick email if you would like to get this months blog newsletter. Tonight I'm going to sit down and stamp again. I'm itching to play with Marina Mist and another of Rach's borrowed stamps! Pop back tomorrow to have a look at that one! So excited to be posting these as I absolutely love this years Jolly Holiday DSP and matching Holly & Jolly rub ons by Stampin' Up!. Perfect for stamped Christmas cards, gift card holders, decorations and more! I have a tutorial set of 10 tutorials, which I am giving away for free with purchase of my Jolly Holiday bundle. If you already have a demonstrator and would prefer to just buy the tutorials, that's fine too. I have included options for both of those below the samples. Here's a sample card from the tutorials. I had so much fun with these and I think they are my new favourite tutorials. I just love this colour combination and the matching rub-ons are awesome! The tutorial package includes 9 Christmas cards and 1 awesome gift card holder which you could make over and over for this years bright and happy Christmas cards. How easy is that? I have also used the new Scallop Trim Border punch and various other punches and one greeting stamp. I have left these as optional because I know many people have already invested in these. Just ask if you would like to add these on. Substitutions are welcome for any of the items in the bundle. The total value of everything you receive is $125.60, but you can purchase the bundle and get the shipping and tutorials free for $103.65. 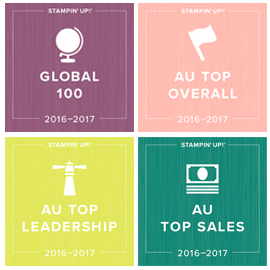 This is available to purchase by anyone in Australia, and the goods will be shipped directly to you from the Stampin' Up! warehouse, and the tutorials emailed as a PDF document. To purchase, you can use the PayPal button here to pay by credit card (you don't need a PayPal account) or you can also pay by direct deposit or credit card over the phone. Just email me (or call me on 03 97352946) if you would like to do that. You can also purchase just the tutorials, which will get you a PDF emailed file of step by step instructions and colour photos to make th 9 cards and gift card holder over and over again. This is just $16.00. 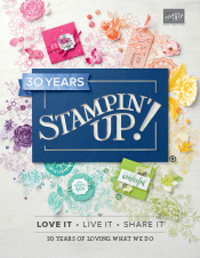 These can be purchased by anyone world-wide including other Stampin' Up! Demonstrators for use in classes and workshops (I just ask that you acknowledge me as the designer, and don't give out the actual tutorials in emailed or printed form). Thanks again for popping by. I will be back during the week with some more creations. Didn't have a chance to create much last week as I had Sam home sick for three days, and now I have Josh sick today. Hoping he recovers quickly as he has a much looked forward to school zoo excursion tomorrow. Nothing like a giveaway to start the week on a happy note is there? Thanks to everyone who gave me their thoughts on the new colour groups. It seems the brights were very popular, but lots of takers for the other colour groups too. I love all the colour groups, but given I am loving Daffodil Delight at the moment, if I had to choose one it would be the Brights too (this week!). So congratulations to Alyssa Byron! If you can email me Alyssa. I can get your blog candy prize out to you. Thanks everyone for playing and I promise there will be more blog candy soon!